If you are looking for the best of DJ’s and sound systems for your wedding, we recommend the following WNY DJ’s and sound systems. Five Brass Instruments, Vocals from the Sinatra Era..PLUS Full DJ Service! We’re Not Only Your Music…We’re Your Entertainment! Because The Success Of Your Reception Depends On The Quality Of Your Entertainment! Elegant Wedding Entertainment Dreams Are Made Of! Scoping out DJ’s and sound systems for your wedding day may seem like an easy task, but there are many things to take into consideration before hiring DJ’s and sound systems for your wedding. 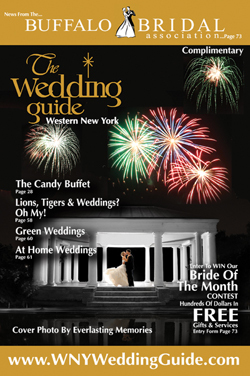 The St. Louis Bride & Groom Magazine published some interesting statistics in 2003 about how brides and grooms feel after the wedding about the entertainment. While hiring entertainment happens to fall quite low on most brides’ priority lists, more than 70% of brides say that they should have spent more time choosing the DJ’s and sound systems once the wedding is over. Again, after the fact, nearly 100% of brides say that they should have spent more money on the DJ’s and sound systems at their wedding. And while it does not fall high on the priority list for brides, the entertainment at the wedding is what 81% of the guests remember the most. And, out of the couples who chose to have a band play at their wedding, 65% wished they had chosen a DJ instead. That is definitely something to think about when you are searching for DJ’s and sound systems for your wedding! So, to help you with making the decision on such an important aspect of your wedding, we have put together some advice for you that we hope will save you from feeling the same way about the DJ’s and sound systems at your wedding. 1. DJ versus MC – Know the difference between a DJ and an MC! Yes, the names are different, as a DJ is a disc jockey and an MC is a Master of Ceremonies, but the names are not the only difference. If you hire a DJ and assume that their responsibility is to be the MC, too, you could be making a huge mistake. DJ’s and sound systems are just that – the music part of the entertainment. A professional MC is well-spoken and knows how to gauge and respond to the audience, in a respectful manner. 2. Planning with the DJ and the MC – You should make time to plan with both the DJ and the MC of your wedding. Both should know the audience whom they are catering to, as well as the bride and the groom to determine what kind of music to play and what should be said during the reception. The more time you spend prepping the DJ and MC of your wedding, the better they will understand what your wants and needs are. 3. Microphones – Check with the DJ’s and sound systems that you are interviewing to ensure that they use wireless microphones and that they also have a wireless lavalier microphone that can be used during the ceremony. This will let you know how advanced the DJ’s and sound systems you can expect will be before the wedding day. When you are planning the entertainment aspect of your wedding day, realize that this is the part that most people will remember for years to come. If you hire DJ’s and sound systems without doing your research and finding the best in town, or if you choose the DJ based on the lowest price, you will probably regret your decision, much like many of the brides and grooms who were interviewed for the St. Louis Bride & Groom Magazine back in 2003. At least now you know that the entertainment, including the DJ’s and sound systems that you choose for your wedding day, should be high on your wedding planning agenda. With this knowledge and our recommendations for DJ’s and sound systems in the WNY area, we are sure that you will make the right decisions to impress your guests and make it a wedding to remember!